Cooking pig can be done in many ways. The most common modern methods of cooking a whole hog is on a rotisserie over a fire pit. This form of fire pit cooking is efficient and relatively easy, but requires special equipment, namely the heavy-duty hog rotisserie which can support a heavy roast. However, whole animals, particularly whole pigs, have been roasted by more primitive means for centuries. More "primitive" should not imply "worse" however. Many polynesian cultures have been roasting whole pig in a barbecue pit underground for centuries and the results can be fantastic! In Papua New Guinea the name for the barbecue pit and the food resulting from this style of fire pit cooking is Mumu. In Hawaii, this type of underground oven is called a Kalua, often part of a Luau celebration. Traditionally, a whole pig is slow roasted underground as part of a huge celebration. Other animals (lamb, deer, etc.) can be cooked in a similar manner. So What Exactly Is a Mumu? The mumu traditionally consists of a hole dug into earth into which many large stones are layered. A large bonfire is then built over the stones for a long period of time to heat them thoroughly. Some of the hot stones are then removed. The stones are covered with leaves, such as banana leaves to help steam the food, and vegetables, including roasting vegetables such as yams and potatoes, are piled on top. A whole pig is then wrapped in leaves and set in the hole and covered with more hot stones. The hole is then covered with dirt to insulate the underground oven. Cooking pig in this manner can take a long time, up to 12 or more hours depending on the size of the cooking pig. At the end of the cooking period, the food is dug up and eaten, usually with much festivity of course! Some people do not trust that enough heat will stay in their mumu barbecue pit for the full time it takes to cook, so rather than cover with dirt, they cover with more rocks and keep a fire going on top of the rocks during the cooking period. However, this does not appear to be the traditional way of doing it. 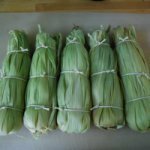 I must admit, I am not the worlds expert in mumu or kalua cooking. While I have seen it done, I have not yet tried cooking pig in this way. 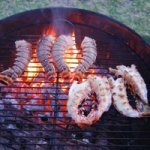 If you are interested there are a couple sites I can recommend to get more information and even pictures of mumu fire pit cooking in action. The Smith College Museum of Ancient Inventions has a description and history of the mumu. 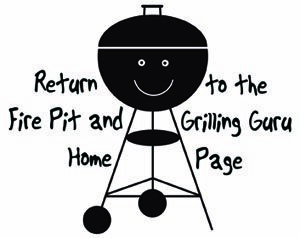 The Team Mumu Pit Cooking Page has one family's personal experience with pit cooking in this style. They seem to have a lot of experience and have cooked several types of animals. They include many pictures and even some video as well. 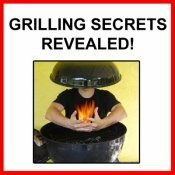 This is a great resource if you are interested in learning more about cooking pig in an underground barbecue pit.I hope this help! Sorry I don't have more personal experience with cooking pig in this manner but I'd love to try it out sometime. Good luck and enjoy!